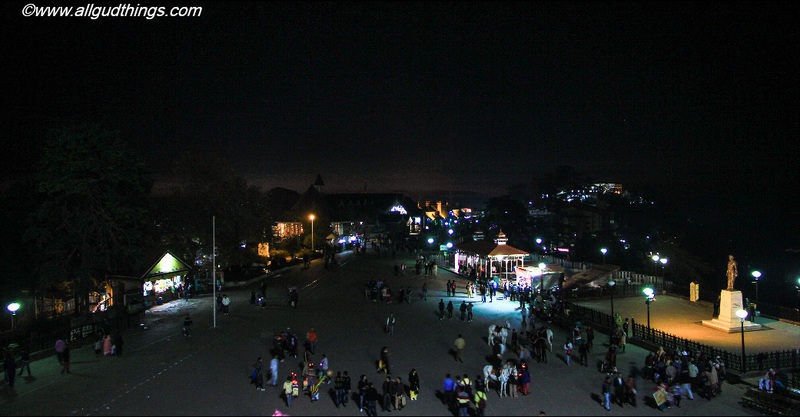 The Shimla town, constructed by Britishers on mountainscapes, seems like colorful dots during the day and glittering “diyas” during the night to me. In fact, the ethereal beauty of whole Himachal attracts me with its new colors and culture. 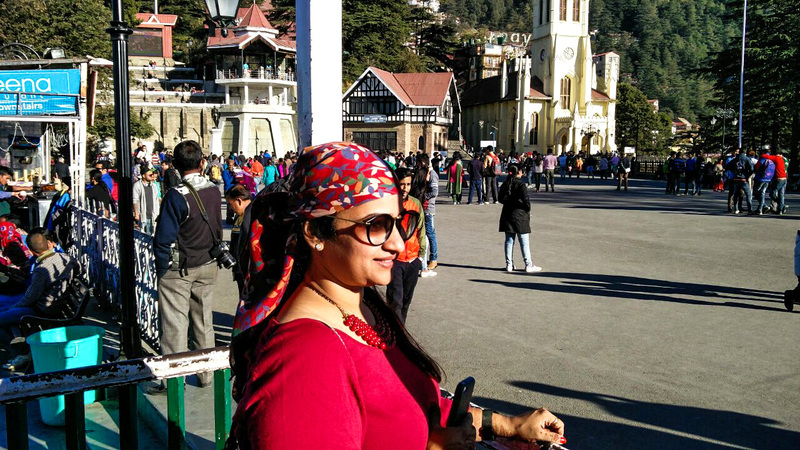 I have done Shimla trip many times and every time its picturesque landscapes and culture introduced me to something new and this time it was a Himachali head scarf Dhatu also known as Rahide. In winters amid cold breeze and bright sunshine, the local people are seen dressed up in colorful clothes with dhatu which makes the whole town colorful. The Dhatu is a 1-meter long colorful head scarf worn by Himachali women. It protects the head from cold breeze and is a part of traditional attire at places. I bought myself one as a fashion accessory. The dhatu is mostly handcrafted and it comes in different fabrics, colors and patterns. The traditional one comes in crimson color with the golden fringes. Fabric – The preferable fabric used for Dhatu is wool and there are further varieties of wool in it like Angora, pashmina, yak, sheep etc. The other types of fabrics used in Dhatu making are chiffon, cotton, silk, jacquard, georgette, velvet etc. Designs & Patterns – The Dhatus come with colorful designs and prints, which depict the rich flora and fauna of the Himachal state. The most common were mythological images, floral patterns, fruits and random designs. It is centuries old accessory; handcrafted by women. In upper Himachal women wear it as a part of culture especially when they visit their ancestral places. Some wear it to protect themselves from cold. Also heard a myth that it is also worn to protect men from seeing women’s hair as men get crazy seeing them. It is extremely simple to wear Dhatu, just like a Bandana. The scarf is worn around the forehead and is knotted behind at the head. Else, you can also carry it as neck scarves. Their awesome prints and patterns can make any of your dress look bright. Dhatu in silk and georgette fabric should be dry cleaned whereas those of wool and cotton can be washed with the mild detergents. Don’t soak it for longer periods as they might lose some colors. The price for this head accessory varies from 150- 1000 Rs. It completely depends upon the material and design. I bought this beautiful red colored woolen accessory in just 250 Rs. (Remember to bargain, if you can). 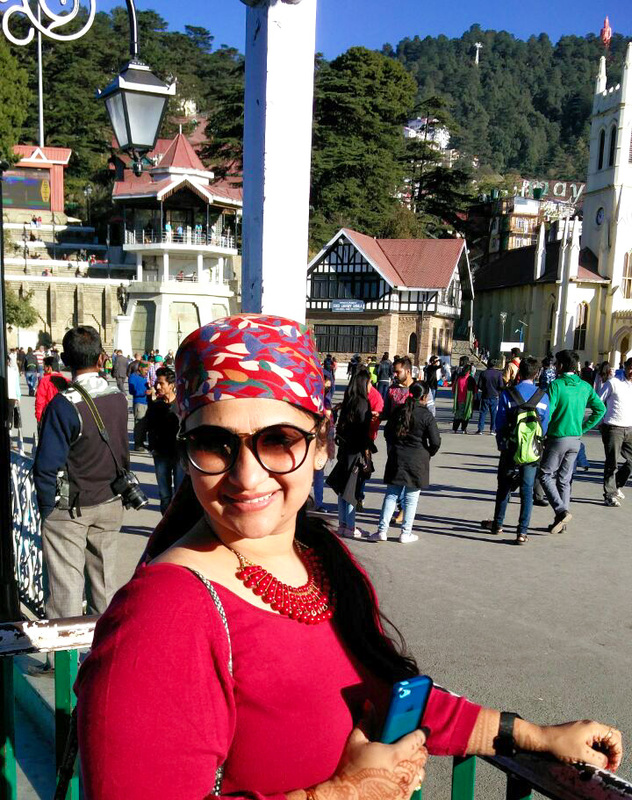 So, I added a one more bright colorful accessory to my collection during this Shimla trip and I wish to keep on traveling and adding more such amazing things each time. I have been to Shimla and love to go back, it has become bit crowded now but i still like it. Agree it is crowded but same here I still like it. I learn a new fashion word – Dhatu! All along I know this as a scarf, and like to wear it to protect my hair from sun damage and dusks, during road travel. Such an interesting word, thanks for this information. I love scarves and pashminas and now I want a Dhatu! The one your wearing looks good on you! I wish I had known this during my trip to Kufri some years back. I love such colorful scarves. Though we have been to Shimla a couple of times, we never knew about the Dhatu. We knew about the headscarf but not what it was called. You have given a fascinating account of the scarf and its history. Really amazing to see the history of this small piece of fabric and understand its significance. I love flaunting this piece. It is warm as well stylish.